Fleece wethers make excellent companion animals, fiber pets and really cool looking lawn mowers! Castrated male sheep (wethers) frequently end up as fiber animals for a variety of reasons: friendly dispositions, high quality wool and the fact that not all males meet our standards for flock sire candidates. Let's face it, not all that glistens is gold! Jacobs have wonderful longevity! Our older gals enter retirement around ten(10) years of age here on the farm - some a little younger, others may be a bit older. With continued care and excellent diet, these ewes will provide you with lovely fleeces year after year. Flock Matriarchs can also help to 'center' a younger flock of sheep, quietly leading them where you'd like to go. This works especially well when carrying grain or treats! Wethers make excellent companions! Sheep are flock animals and rarely like being alone. Rams often get destructive and take their loneliness out on fence posts, barns, etc. Consider adding a fiber animal to your flock today! Fiber pets are often friendly animals, typically wethers, but may also include older female sheep who are no longer desired or needed for breeding but still produce excellent quality fiber as they enter their twilight years of retirement. Ask us about details & availability! Who doesn't want the coolest lawn mower in town? Jacobs fit the bill perfectly! These hardy and adaptable sheep provide an eco-friendly way of keep those awkward hillsides trimmed without the cost and hassle of finding someone to brush hog. Jacobs love to forage ~ certain weeds, fallen apples and multi-flora rose are preferred! Jacob sheep wool varies greatly from sheep to sheep. Fleeces are medium type with varying degrees of crimp. 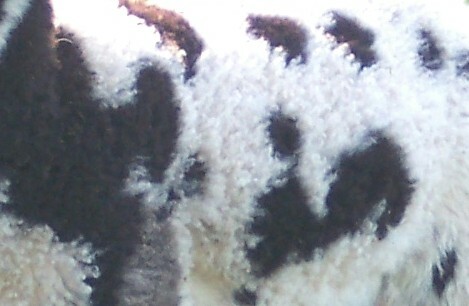 Black/white and lilac/white are the most commonly seen fleece colors but the shading differs in certain lines. Some of our Jacobs retain that deep, dark black while others fade to a heather gray as they age. Our lilacs also vary from a bluish hue to mousy taupe color of brown. Imagine the possibilities!